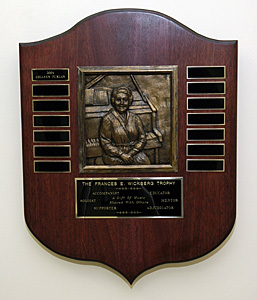 Family and former students donated the Frances A. Wickberg trophy to the Winnipeg Music Festival in 2004. Frances studied piano with Muriel Cottingham and voice with Gladys Whitehead, Lucien Needham and W. H. Anderson. She was a member of the CBC Winnipeg Choristers under F. Hubble and W. H. Anderson, and was a church soloist for many years. Recipient of a University of Manitoba Gold Medal for Singing, Frances began her involvement with the Winnipeg Music Festival as an accompanist for her students and for school choirs. An examiner for both the Western Board of Music and Conservatory Canada, Frances has adjudicated in festivals from Newfoundland to British Columbia. She has served on Winnipeg Music Festival committees and on the Board of Directors. Her love of music, shared with her students, has carried on through their involvement in the Winnipeg Music Festival as participants, teachers, accompanists, committee members, members of the Board of Directors and staff.